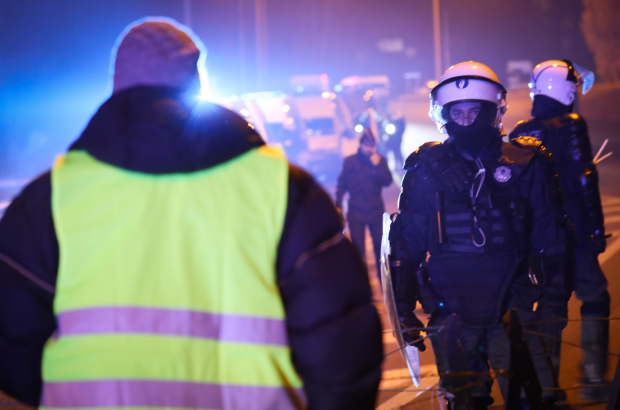 Avoid driving around the EU district on Friday afternoon, police have warned, as the "yellow vests" protest movement has called a demonstration next to Schuman roundabout which could cause severe traffic delays. The citizens' movement against fuel prices and the rising cost of living has spread to Brussels, after almost two weeks of sometimes violent protests in France and Wallonia. A Brussels-Ixelles police spokeswoman confirmed that authorisation had been granted for a rally on the Rue de la Loi from 12.00 on Friday. Protestors will gather between Schuman roundabout and Cinquantenaire park before heading up the road towards Arts-Loi crossroads. Representatives of the protest movement will then have a meeting with prime minister Charles Michel. "This is obviously a major traffic route, so it will cause disruption," the police spokeswoman said. "Traffic police will be out on duty and others standing by to ensure public order." Asked why the city had given authorisation for the march - given recent violence by yellow vests in Wallonia - Brussels mayor Philippe Close told RTL: "We have a constitutional right to express our opinion. "In the City of Brussels alone there are more than 900 demonstrations each year, the majority of which have nothing to do with Belgian politics. We are a big European capital that guarantees freedom of expression." But he warned the participants: "If you break things, if you come to Brussels and break the law, you will have the police to deal with." If you can afford the day off to protest, YOU CAN AFFORD THE RISE IN FUEL COSTS. Stay in your hovels or drag yourselves into the 21st century. When there is a demonstration, can we all be exempt from paying taxes? It would be nice to think these protests will have some effect in Belgium but when it comes to lowering taxes, the Belgian government(s) turn a stone-deaf ear.